Media captionWhat was behind last month's well documented handshake? US President Donald Trump has accepted an invitation to attend this year's Bastille Day celebrations in France. Mr Trump will join the 14 July annual military parade in Paris, which this year marks the 100th anniversary of the entry of the US into World War One. His relationship with President Emmanuel Macron has had a rocky start. Mr Macron has sharply criticised Mr Trump over climate change and said their handshake when they met in Brussels last month was "not innocent". Mr Trump's acceptance also comes amid confusion over whether he will take up his state visit to the UK. 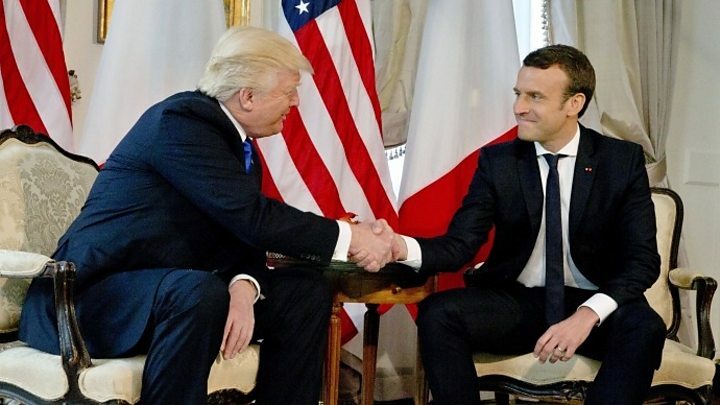 Mr Macron's office confirmed in a statement that Mr Trump had accepted the invitation, while the White House said President Trump looked forward "to reaffirming America's strong ties of friendship with France". "The two leaders will further build on the strong counter-terrorism co-operation and economic partnership between the two countries, and they will discuss many other issues of mutual concern," the White House statement said. The pair have not exactly seen eye to eye since Mr Macron was elected. The French president has severely criticised Mr Trump's decision to pull out of the Paris climate accord. He commandeered Mr Trump's election phrase "make America great again", turning it into "make the planet great again", doing so in one video alongside Arnold Schwarzenegger. 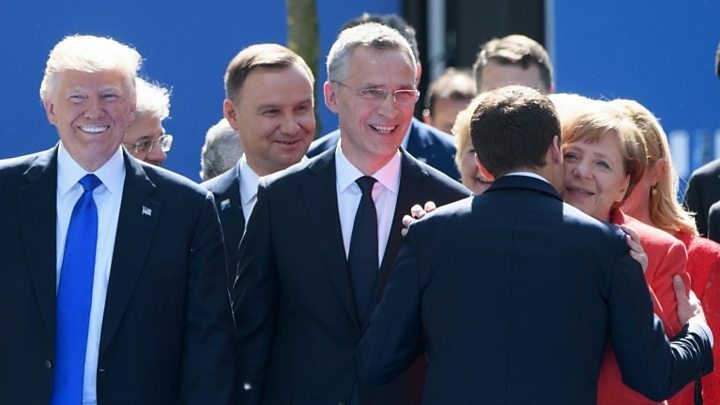 When the two leaders met for the first time on 25 May in Brussels, ahead of a Nato summit, the meeting was notable for the handshake between the two men. The awkward encounter saw each grip the other's hand so firmly that their knuckles turned white. 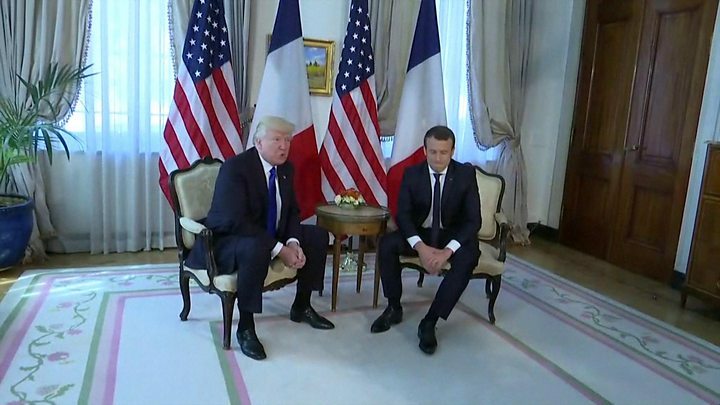 The vigorous embrace continued for several seconds as Mr Macron and Mr Trump looked each other fixedly in the eye until the US president attempted to disengage. Mr Macron later said the handshake was "not innocent". Media captionDid President Macron snub Donald Trump here? Bastille Day marks the date in 1789 when a mob stormed the prison on the site in Paris, helping to start the French Revolution. This year's Bastille Day will also carry a sombre note. Last year, at least 84 people were killed, including more than 10 children, when a lorry slammed through a crowd as they celebrated in the southern French city of Nice. Mr Trump's acceptance of the French invitation comes as his UK visit remains in the air. Last week, there was no mention of Mr Trump's UK visit in the Queen's Speech to Parliament, as is traditional when setting out state visits for the year. The US president accepted the Queen's invitation for him to travel to Britain when Prime Minister Theresa May visited Washington in January. But there have been reports that Mr Trump changed his mind and did not want to visit while there was potential for protests against him. It is far from certain he will avoid them in France. Left-wing lawmaker Jean-Luc Mélenchon said: "Donald Trump is violent and has no reason for being here." Video Did Macron snub Trump? Video Who has faced the Donald Trump handshake and won?